"Oh that is so gross looking, but tastes so yummy"
I'll post a few pictures when I get home tonight, but I think it was a hit. Everyone was grossed out but intrigued just the same! I would highly suggest making this for your next family function! The Kitty Litter Kake was REALLY a hit, as much as everyone was grossed out they were even more so intrigued by it. 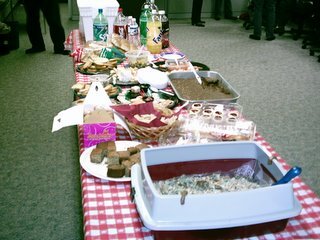 Of all the desserts (and there were a lot) it was the one most eaten in fact we took it back up to our cube area and everyone grazed throughout the afternoon. About 4:15 I cleaned up to get ready to go home and I dumped everything in the trash, not two minutes later I hear someone come walking down and ask where the dessert is....I offered it out of the trash (a la Seinfeld) but they didn't accept. Q: Was that a new pan? A: Yes it was only used once before this. Q: Are these tootsie rolls? A: Yes, all of them except one. The best comment was from someone who had picked up one of the "turds" and said "I just can't eat this, I don't know why?" and then proceeded to place a napkin gingerly over the plate to hide it. I'm glad it was a hit! I assumed it was de-lish. From the pictures, it looked like nothing but cake and candy. Who cares what that looks like, it's bound to taste amazing! Pass on the recipe, will ya?? You know, that might be the perfect dish for my next in-laws get together! I had to refresh your screen. i figured you had to have posted something!! I actually have had your Jan 6th entry up and thats it!! freaky. if you don't hear from me in like two days.. just e-mail me to get with the program!! Glad it was a hit! Though I think it would take me much will power to try it - it just looks sooooooo gross! OMG that looks totally gross!!!! Glad it was a hit tho!